Return to the City State Scour the slave markets of the Invincible Overlord, solve the mystery behind the temple tempters or delve into the intrigues of the Black Lotus. Crawl through the catacombs beneath the city, and encounter the minions of the Wraith Overlord! 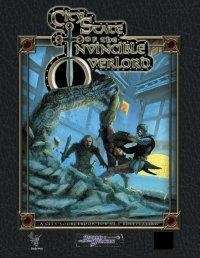 The First And Best Fantasy City of All Time Judges Guild’s City State of the Invincible Overlord has been updated for today’s gamer. Nothing ever produced can compare to its scope and scale. It contains over 300 fully detailed shops, hundreds of interesting NPCs and a full color fold-out map of the city. For the first time ever all in one place, you’ll find the original City State plus content from the rare Judges Guild module Wraith Overlord. Thousands of hours of adventure are all in this one huge, fantastic sourcebook! Hardcover. Sword & Sorcery books are published under the Open Game License and are 100% compatible with v.3.5 rules. What is the difference of this one compared to the ones on the Judges Guild web site? One of the summary maps is botched. The map showing the "City-State Sewers" and all of the dungeon detail is missing "The School of Ancient Knowledge" and "The Three Temples." It instead uses 1/4 of a very large image to duplicate maps already included in the image. Did you get a resolution to the map issue. Did you try posting on Judges Guild forum, or contacting them directly? Does anyone know if the judges map of the city is high enough resolution for printing? Yes, more than high enough resolution. It comes in 4 pieces and, when combined in image editing software, the final resolution is 13050 x 9976. It also comes with a one-shot map that is 6525 x 4988 which is a good size for actual use. The problem is that these are all embedded in the PDF and need to be extracted. A free tool like Nitro Reader might get it done. This title was added to our catalog on October 04, 2004.